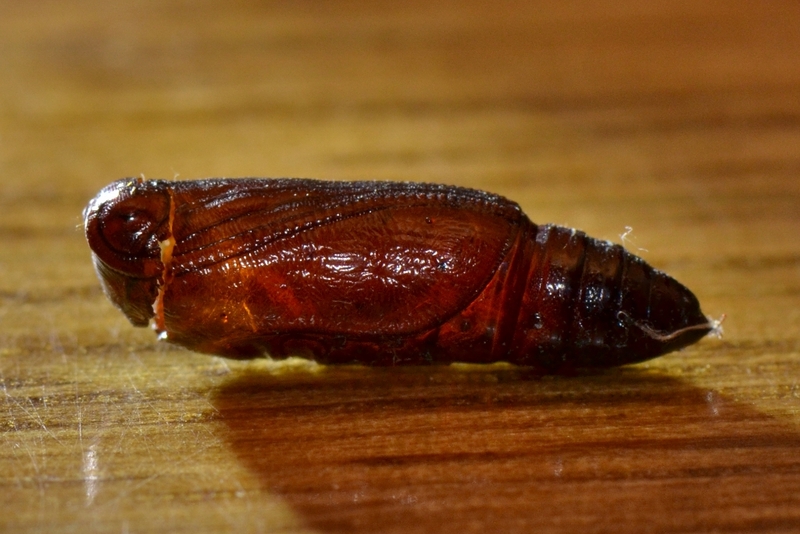 Perhaps, I should have called this post, "Pop Went The Pupal Skin" since what popped the "head" off of this pupal skin wasn't the original occupant. 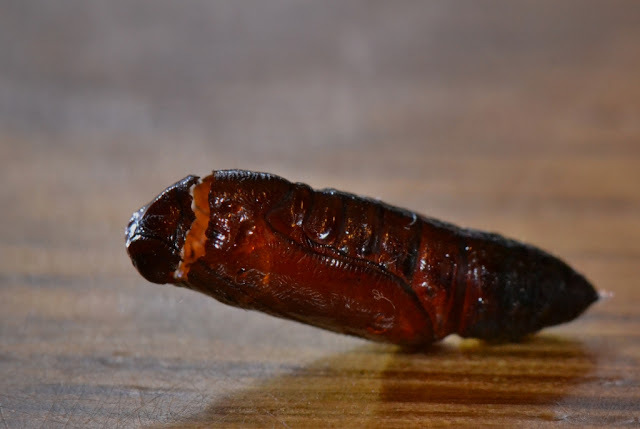 We found this small moth pupa under a piece of bark on a dead hickory tree that had I cut down (this kind of thing happens when a naturalist cuts firewood ). We put the pupa in a cup and basically forgot about it. Last night I heard some small popping noises among the collection of nature items on my desk. I found the noise was emanating from a cup that contained the pupal case of a butterfly and a moth. I set the cup in front of me for observation. The noise continued intermittently for a few minutes. Then it quit. When I glanced up, I saw this freshly emerged ichneumon wasp. 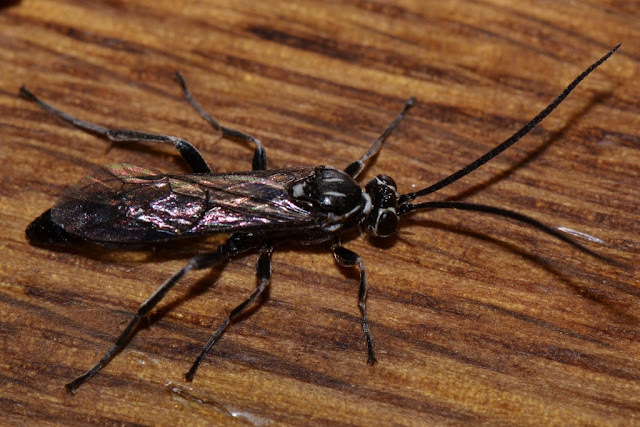 This small, black-and-white ichneumon wasp is about a half an inch long without measuring the antennae. 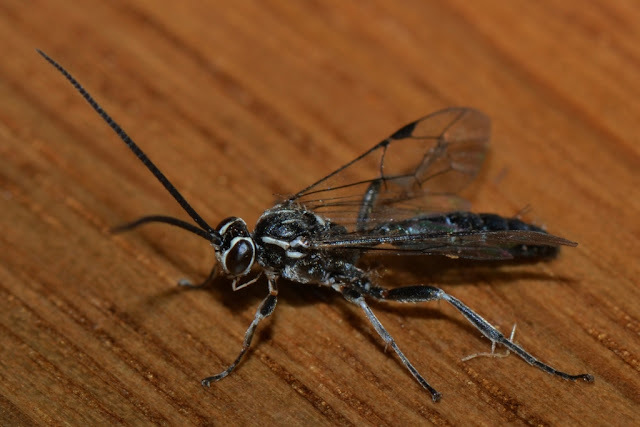 The larvae of this ichneumon wasp probably grew from an egg deposited in the host caterpillar. 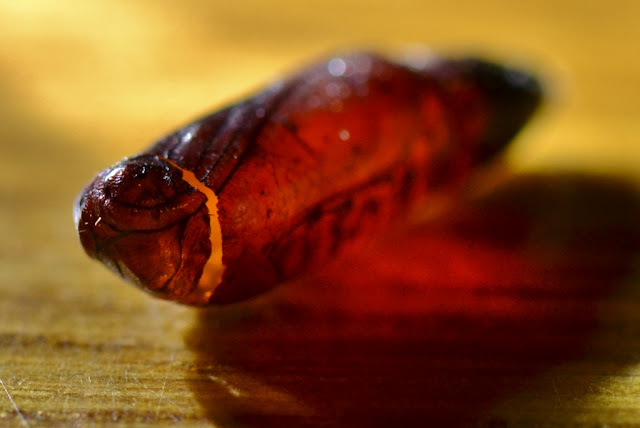 After the caterpillar pupated, the wasp larvae killed its host and continued to feed and grow inside its host's pupal case. After we brought the pupa into the house, the wasp probably pupated within the pupal case and I spotted it soon after it popped the hatch. Notice the dark frass pile in the tail-end of the pupal case. 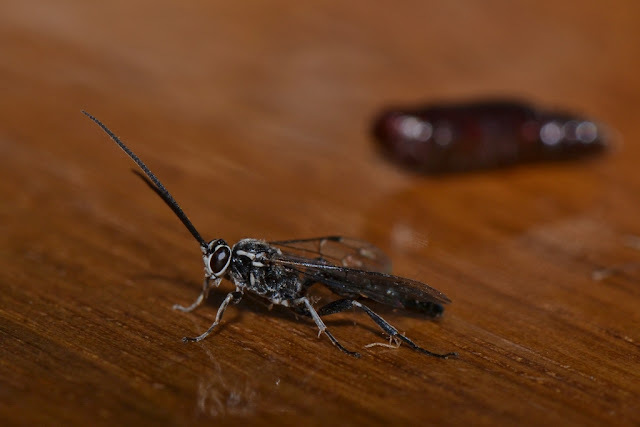 I took these photos toward a light to show the empty pupal skin (except for the frass), and also accent the wasp's escape hatch. I wish I would have thought of holding the pupa up to the light a few days ago... I could have previewed what was going to emerge. There is an incredible amount of parasitism happening in the pupae of insects. I should not have been surprised to have this sharp-looking, parasitic wasp pop out of a pupa. You may not be surprised, but I sure the heck was. Amazing, Dana.